My New Year’s resolution is to hike a new trail every weekend. 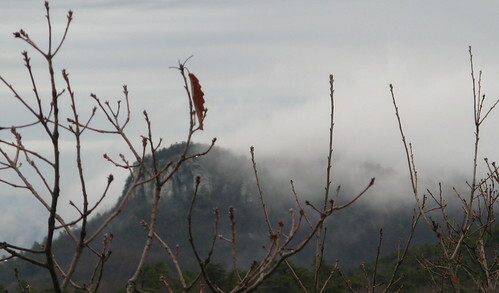 But coming up with a resolution was about as ambitious as I got Sunday morning, as I was satisfied with a jaunt to trusty ol’ Hanging Rock State Park, where I checked out the Cook’s Wall Trail for the first time. I set out into a gray drizzle for the hour-long drive up to Hanging Rock, which had one consolation: ideal light for a side trip to shoot Lower Cascades Falls, the park’s best waterfall. That’s it pictured above. I had the rocky area across from the plunge basin all to myself so I had plenty of room to experiment. Get this: I’m still using the digital camera Fedak donated to the blog ages ago — dropped it right on the rocks again today and it’s still working; none of the cameras I paid for were ever this lucky. 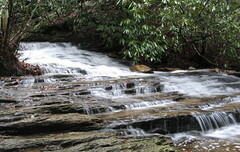 The pic above left is Cascade Creek just down from the waterfall. I was tempted to hang around and soak up the scenery all day but I remembered I hadn’t posted a hike here in almost a month, so I set out in search of more serious trail (it’s only a half-mile down to the falls from the parking lot; nice walk but not a hike). A week ago we had six inches of snow covering all these trails. 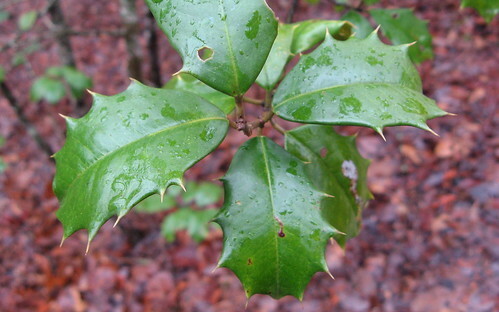 It rained all day yesterday and by today our White Christmas was a soggy memory. 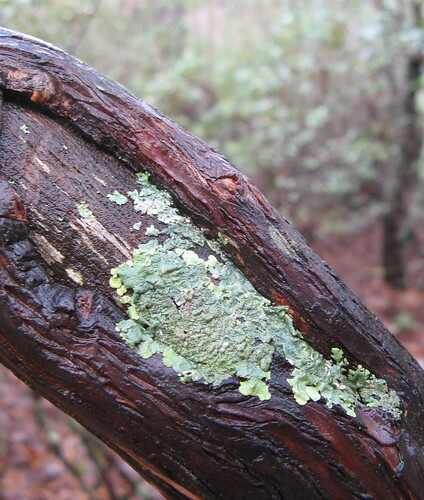 Upside of the rain was the whole forest had a fresh-scrubbed gleam about it. Here’s one example on the trail down to Lower Cascades Falls. Even the last few leaves stubbornly hanging in there seemed to have more visual pop. After my side trip to the falls I headed up to the main section of the park, picking up the Nature Trail near the old bathhouse at the lake. Just up the trail a sign points to a left turn for Cook’s Wall Trail, 2.2 miles distant. First you walk up to a ridge, then follow it for a mile an a half out to Cook’s Wall. 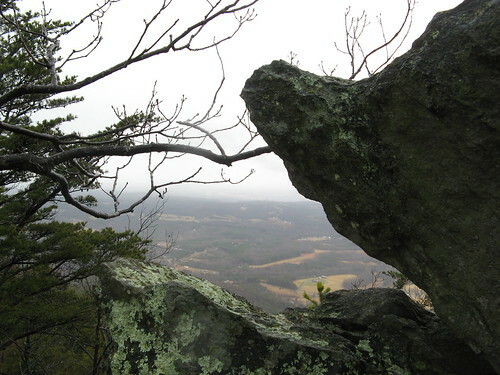 For a loop, return on the Wolf Rock Trail to Hanging Rock Trail, hang a left head and back to the parking lot. From there, it’s pretty easy to navigate your way back to the second lot near the lake. Pictures like this really benefit from using a high-quality camera. 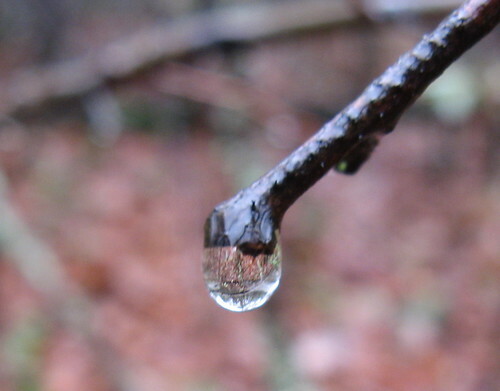 Here you can just barely notice the reflection of the countryside in the drop of water; imagine the clarity with a high-dollar Nikon. The weather worsened continually after I took that shot. It wasn’t so bad on the climb up to the ridge, but the further down the trail I got, the windier and rainier things became. I walked right past Cook’s Wall and walked on till I ran out of trail near a bunch of big rocks and a tangle of wet trees. Persistent drizzle and a howling wind made a mess of things but my rain gear kept me reasonably comfy. The occasional rainy hike is a nice departure, but I’d just as soon not develop a habit. The rocks on the Cook’s Wall Trail are awesome. These are near the end of the trail. Here’s a misty shot of the return hike. 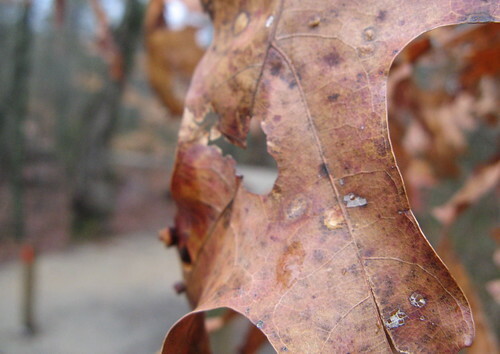 It’s striking how color persists in the so-called dead of winter around here. Cook’s Wall is near here, I believe. I can’t say that I saw the actual wall (usually you just listen for the voices of the climbers calling back and forth up the cliff but none were out today). One must stop along this hike is House Rock, an excellent series of snags looking out over everything nearby. This is Hanging Rock shot with my tripod on maximum zoom. 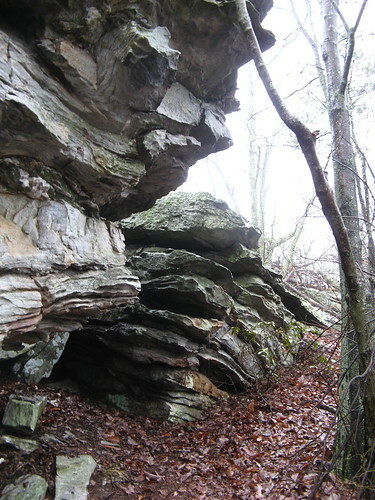 Wolf Rock is yet another way-cool formation. Frankly all the best rock outside of Hanging Rock itself is along this section of ridgeline. 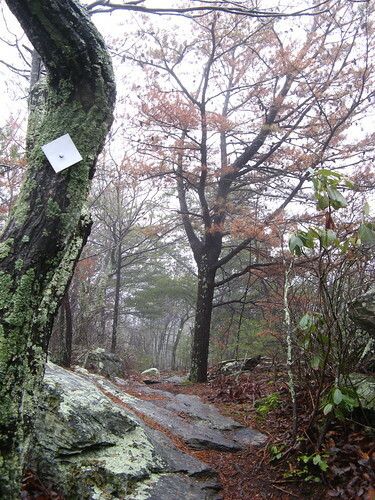 Most hikers prefer to trek up to the old fire tower at Moore’s Knob, but if you’re into geology (or just like to look at wacky rocks), this is the place to be. Shiny wet tree on the Wolf Rock Trail. Sun finally peaked out as I was finishing up. It lit the face of Hanging Rock quite nicely. OK, that should do it for Hike 1 of 2011. 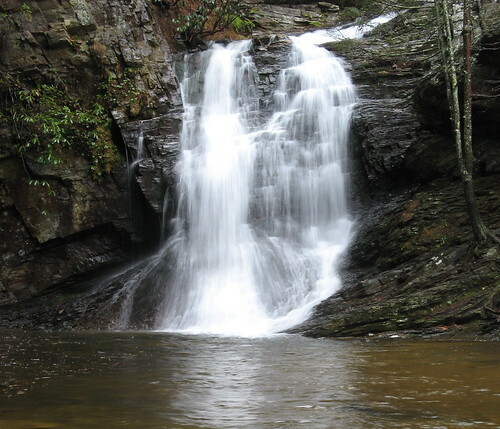 EveryTrail Guide: Waterfalls of Hanging Rock. 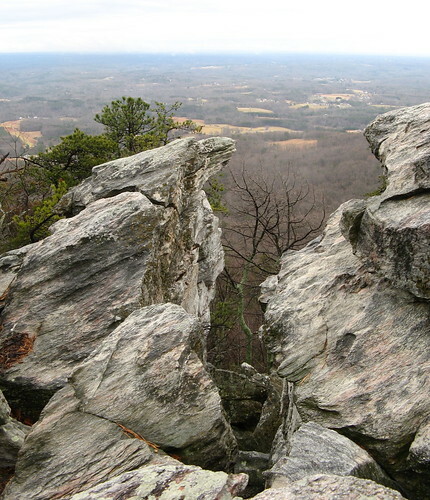 My previous Hanging Rock hikes. 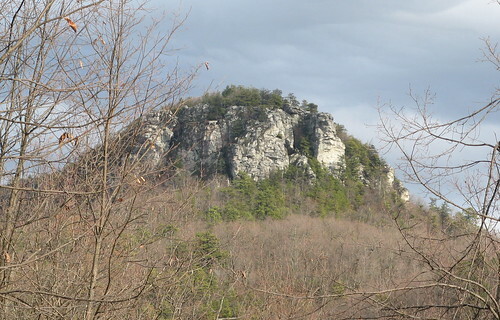 Hanging Rock page, North Carolina State Parks. Tom – looks like a really cool hike…very beautiful scenery (reminds me of home sweet home in southern Indiana)….and great photos, despite not having a high-dollar nikon! I’m planning to hike but have never been on one before. I’m a poor college kid who needs more gear. These were very aesthetically pleasing and very encouraging to see.